In addition to the lectures, workshops and shows planned in the program, the iX Symposium 2018 presents the iX Path, a circuit of 39 experiences at the SAT and in its surroundings that will allow you to live your own immersive experience (iX). Virtual reality, augmented reality and hybrid installations, the experiences offered were created by artists from all over the world coming to present their works specifically for this event. Addressing a multitude of themes such as ecology, politics, art or design, this 360° circuit will show you how immersive technologies are building the future! 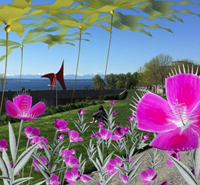 Augmented Reality installation by the pioneering artist Tamiko Thiel, developed in collaboration with biologists, Gardens of the Anthropocene shows us how our urban environment will look in the Anthropocene, when invasive plants have taken possession of the territory. 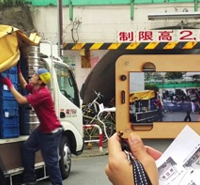 Masaki Fujihata plunged into Hong Kong's city archives and reconstructed 1960s urban life scenes that he recreated on the streets of the Chinese metropolis. A preview of the final work, this first version will be presented in augmented reality in the streets of Montreal’s Chinatown. Enemy transports you to the heart of a colliding of combatants from three conflict zones. 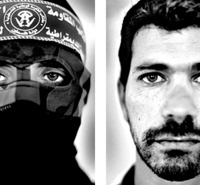 Through an augmented reality window, their testimonies and confessions about their lives, their experiences and their perspectives of the war will allow you to better understand their motivations ... and their humanity. What happens when a young female coder joins a male-dominated drifting start-up? With a funny touch, UTURN is an immersive VR series where viewers can experience both sides of the gender divide. UTURN innovates by placing viewers in the middle of two interlaced stories, told from a feminine or masculine point of view. 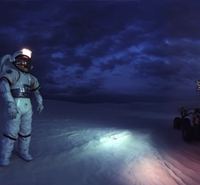 The now famous Studio Felix & Paul offers us a VR series on the new age of space exploration by revealing the most ambitious journey of humanity, striving to understanding our planet, our universe and our origins. Held at the SAT, the experience will be specifically augmented by a haptic dimension. Decentraland is the first platform whose virtual universe is owned by its users. 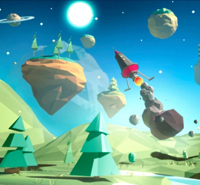 Opensource, decentralized and powered by blockchain technology, the universe of Decentraland does not aim to resemble the physical world. On the contrary, it endorses all possible political, economic and social utopias. Aboriginal Territories in Cyberspace (AbTec) is a research-creation network made by and for Indigenous people. With AbTeC Island, they set out to discover AbTeC Island in Second Life, a space to make films in a virtual environment. The famous Ubisoft game will be augmented at the D-Box haptic technology symposium for an even more surprising and immersive experience! 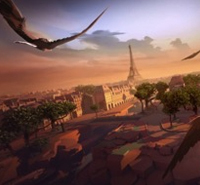 50 years after humans have disappeared from the face of the earth, nature has taken over the city of Paris, leaving a breathtaking playground that you will fly over and explore like an eagle.